With the political leaders of Europe seemingly now brain dead or taken over by some sort of 7th Century evil Islamic mind control causing them to act as if they are helpless to prevent their women from being gang raped and their culture and society taken over by Muslims who hate them. We are watching Turkey being changed from a secular society into an Islamic State. And ISIS spreading across the world like a wildfire. You don’t have to be real smart to know that Jews and Christians are in serious trouble worldwide, including in the United States. Some in the earliest Christian community in the world, in Syria, are being murdered in the thousands. Their heads being impaled on posts around the cities- even including children. With our many contacts throughout Europe, Turkey, and the Greek Islands we know Jews have never lived in greater threat to their lives since the 1930’s and 40’s. There is no doubt that another Holocaust is on the horizon and this time God is giving us plenty of warning in advance. We will not be able to say; “Sorry God, we just didn’t know”. For those who have been called to this ministry they know we have accomplished what seems to be a lot, but in reality not near enough. We have the following boats. This Gullet has just had a new motor installed, and the Motor Yacht is ready to go. Both of these boats are good for what we need if we only had 30 or 40 to pick up in each boat – but most likely the numbers will be much higher and we will be placed into a terrible situation where we will have to say to many “sorry there is no room for you”. A larger boat is needed and needed right away as I know these boats will be very busy very soon. Because of their size we will most likely be picking them up from the Turkish or Greek coastline and carrying them to Cyprus or a Greek island in order to make quick trips picking them up to save their lives, hoping later to go back and bring them to Israel. Both of the above boats would be great for anyone wanting to move to Israel and have good living conditions ready for them, and if they were willing to then join in with us with their boat to save Jewish and Christian lives. If we could make quick sales of these boats to believers who want to move to Israel we could take the money and buy a larger boat capable of carrying more than both of them combined. One that carries many more passengers and has a further range of operation. As far as knowledge of sailing and a captain’s license are concerned, we could take care of that for you if needed. If you, or anyone you know who could be interested they need to contact me right away.Time is of the essence – but I don’t need to tell you that. This is a very serious proposition for the right people. 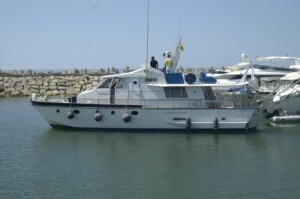 As it stands at this time, we have these two boats and a smaller faster boat for quick trips to Cyprus and back. This vessel is, and has been, used as a rescue boat in the event either of the two boats above need help anywhere in the Med. My suggestion for anyone interested would be to come for a look at the boats, and make your decision – but do it soon if you’re interested, and by the way, please don’t waste my time if you are not truly interested. Prices can be discussed when necessary. Both boats are now moored in Israel. We are getting ready to move one to Turkey in order to have it closer to pick up points as things are really heating up in France and Turkey. With $400k we could purchase a boat capable of carrying more than twice what both the above boats can carry and have more than twice the range and speed. 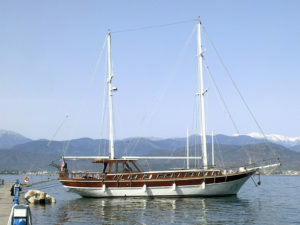 Boat owners in Turkey are hurting because they use them for charter and their business has dried up with the lack of tourists. With all that said, we will do what we can with what we now have, but many will be left simply because “I” was unable to raise the needed finances from those God has brought to this ministry. I confess my inability to raise the needed finances so now I don’t have anything to do other than just say to God that I tried and will keep trying. Only you can convince the right people to give out of what they see as their security for the future. In the meantime we have the burden of helping a few families here in Israel with some basic foods to survive. And to build a food supply for the time when it may be needed for those who come here in a time of war and need a lot of help. I could go on and on but if it is now time for everyone reading this to pray and ask God to show them the truth and what part they can and must play in this ministry, please do so with great urgency?